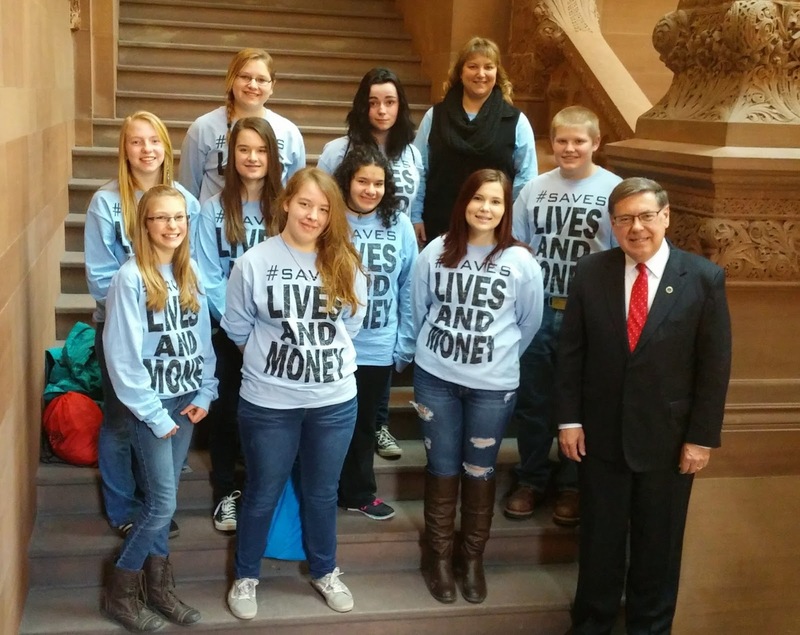 ALBANY, 02/26/15 – State Senator James L. Seward (R/C/I-Oneonta) met this week with high school students from Reality Check – Schoharie County. Senator Seward welcomes Reality Check students to Albany. From left, front row – Ashley Fancher, Sheridan Smith, Madi Yung, Senator Seward. Middle row- Emily Skowfoe, Taylor Marshall, Kathleen Hannamann, Ethan Keidong. Back row – Gabby DeRocher, Emily Tuck-Fydenkevez, Middleburgh Reality Check Program Coordinator C.J. Smith. The students discussed recent field studies they have conducted to gauge the use of tobacco advertising at retail locations. They also detailed the health and financial benefits of smoking cessation and tobacco control programs conducted by the New York State Department of Health. Lost productivity from smoking costs New York State more than $6 billion annually. Reality Check is an anti-smoking movement sponsored by the New York State Department of Health which alerts teens to tobacco company marketing strategies and promotes teens as decision makers in their own lives, as well as role models in their communities.